For many in today's interoperability landscape, REST reigns supreme. With the overabundance of tools and approaches to REST API development, what tools do you choose and what do you need to plan for before writing any code? 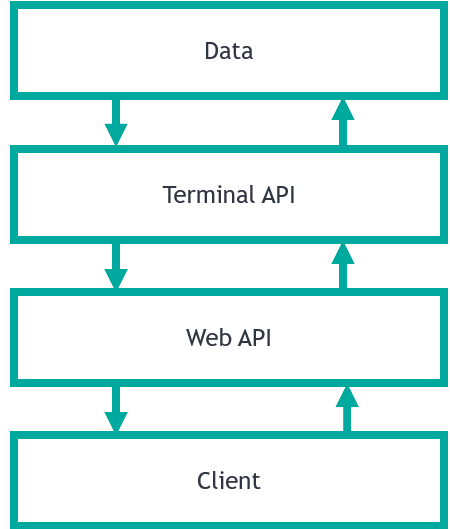 This article focuses on design patterns and considerations that allow you to build highly robust, adaptive, and consistent REST APIs. Viable approaches to challenges of CORS support and authentication management will be discussed, along with various tips and tricks and best tools for all stages of REST API development. Learn about the open-source REST APIs available for InterSystems IRIS Data Platform and how they tackle the challenge of ever-increasing API complexity. The article is a write-up for a recent webinar on the same topic. Persistent data, such as classes. Converts an incoming request into a form understood by terminal API and calls it. The result returned by the terminal API is converted into client-readable form (usually JSON) returned to the client. Web API does not interact with data directly. I use the term Web API and not the REST API because Web API can be implemented using a different architecture, for example, based on the WebSocket protocol, which is also supported by the InterSystems platform. This separation removes complexity from your application, facilitates its debugging. This approach is called a multitier architecture. If the client sends GET request to /path/10/20 the ClassMethod of Package.Class would be called with arguments 10 and 20. Abstract broker converts requests, checks CORS requests and performs other technical tasks unrelated to REST API logic. Brokers 1..N contain methods that process requests by calling terminal API methods and returning terminal API responses to the client. In this example, all requests starting from /form are passed to Destination.Broker. It makes broker separation possible. CONTENTTYPE — adds information about response being JSON. CHARSET — converts the response into UTF8. UseSession — use sessions to track users, more on that in Authentication. Since all brokers are inherited from one abstract broker, it is sufficient to specify these parameters once in the abstract broker (remember, that only parameters of the primary superclass are inherited). One of the problems that often arise when developing a REST API is copy-pasting code from one broker to another, which begets a large number of routes, and copied code and is a bad practice. To avoid this, I recommend using code generation with the %Dictionary package which contains all meta information that you may need for method generators. An example of a large scale use of code generation is RESTForms library. Finally, the use of code generation allows you to achieve greater uniformity of your REST API. All web applications allow only authenticated (i.e. password) access. All web applications have reasonable Session timeout (i.e. 900, 3600). All web applications have the same GroupById value. All web applications have the same cookie path. REST client (Postman) - is a primary debugging tool for a REST API developer. It allows saving and documenting requests, prettification of JSON responses, sending requests into several environments, and provides many other tools for a developer. Intercepting proxy server (Fiddler) - allows a developer to intercept, display, edit and duplicate requests. Packet analyzer (Wireshark) - helps in the cases of broken packets, encoding problems, analysis of the remote headless system and other situations when the above-mentioned tools are not enough. I strongly recommend against using command line tools such as curl and wget. Also, I have written a series of articles (Part 1 - external tools, Part 2 - internal tools) about various approaches to REST API (and not only REST API) debugging. Some examples of working REST APIs. Additionally documentation has a tutorial on REST. There are several courses on REST on Learning.InterSystems.com. And there are some Open-sourced REST APIs available on GitHub. RESTForms facilitates the creation of new REST APIs by providing a robust self-discovery generic REST API solution. Available since 2016.1+. I have written about RESTForms in detail: part 1, part 2. This project actively uses code generalization (using code generation and %Dictionary package). The REST API Design and Development webinar is now available on learning.intersystems.com!